The super premium SUV space is heating up, with players from Bentley to Lamborghini offering big-dollar, high-riding sport ‘utes for the well-heeled set. The newest force in this expanding segment is none other than Rolls-Royce, the Goodwood, UK-based brand that recently took the wraps off its new Cullinan. Here are seven facts that help the Rolls-Royce Cullinan distinguish itself from its six-figure competitors. You wouldn’t know it based on its penchant for preciousness, but Rolls-Royce has a history of getting down and dirty offroad. It all started more than a century ago when the then-fledgling carmaker conducted rough road testing during the Scottish Reliability Trials of 1907 and the Alpine Trials of 1913. Around that time, British businessman Frank Norbury also drove his Silver Ghost a total of 620 grueling miles from Bombay to Kolhapur, without incident. Not long after, T.E. Lawrence (a.k.a., Lawrence of Arabia) used two Silver Ghosts nicknamed ‘Blast’ and ‘Bloodhound’ and his personal steed ‘Blue Mist’ as tenders for the Army, transporting goods through the Sinai and Palestine deserts. It may not match the on-road performance of the 187-mph Bentley Bentayga or the 641-horsepower Lamborghini Urus, but the Cullinan’s air suspension helps it stand taller than its peers, with a towering 72.2-inch ride height that should enable it to ford streams (and peer past plebeians) with ease. Want to avoid an awkward climb into the elevated cabin? Have no fear: Just touch Cullinan’s stainless steel door handles, and the body dips 1.5 inches, bowing to welcome you into its lavish interior. Though not as offroad capable as its peers (think gentle trail, not treacherous hillclimb), Cullinan was nonetheless rigorously “tested to destruction” around the world, according to Rolls-Royce. 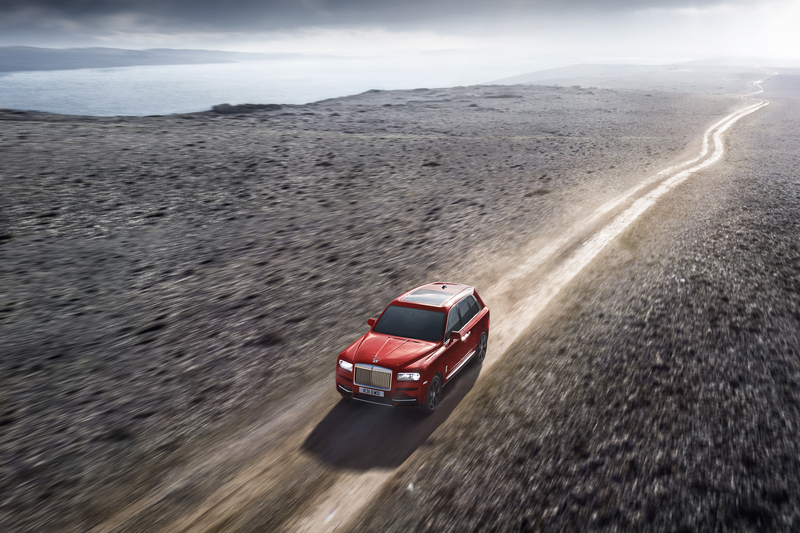 Considering Rolls is owned by BMW, the brutal R&D regimen is not surprising, though we’d take great pleasure in wringing it out in the great wide open, just to be sure. Don’t let the massive proportions fool you: Cullinan is powered by the same twin-turbocharged 6.75-liter V-12 in the Phantom that produces 563 horsepower and 627 lb-ft of torque, a ginormous twist figure that starts its peak at a mere 1,600 rpm. The 5,864-pound behemoth will also drive smaller than its heft might suggest, thanks to an all-wheel steering system that helps swing the tail into corners at slower speeds. While its exterior styling is surprisingly austere, the Cullinan’s cabin is everything you’d expect from the brand. From the vast expanses of wood veneers to supple leather that seems to cover virtually every surface, the new RR sport ‘ute just might win the contest for plushest interior. Proving that it’s capable of tackling more than tony boulevards, Rolls upholstered the upper fascia in a box grain leather that’s durable and water resistant, similar to the type used in high-end Italian luggage. 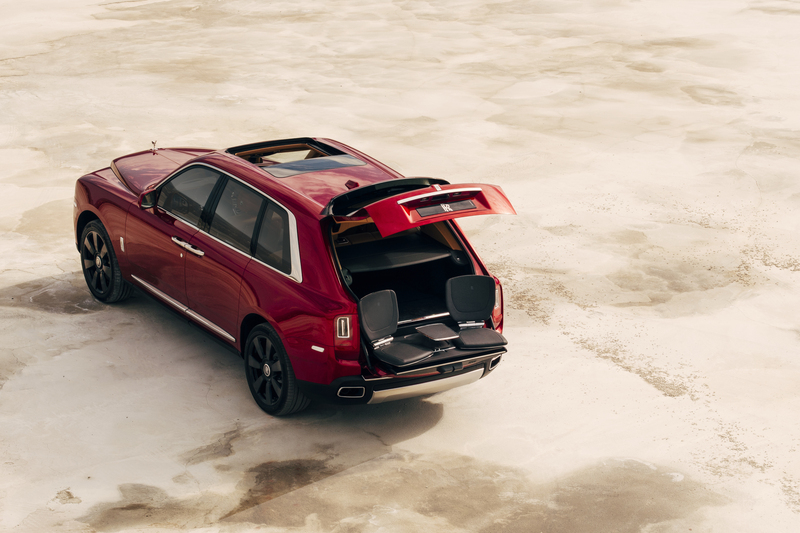 Among Cullinan’s high-end bag-o-tricks is a rear aperture Rolls refers to as “The Clasp.” The first of its kind in any Rolls, the twin aperture opens to unveil up to 21.1 cubic feet of volume when the rear seats are folded down. Sure, there’s an available onboard fridge with a whiskey decanter, tumblers, and champagne flutes, but there’s also enough space to stow cases of bubbly—or kegs of draught beer, if you’re so inclined. Even better, the tailgate can be configured to hold two outwardly facing seats, perfect for a good old-fashioned tailgate fête. Vehicles in this rarified realm are all about surprising details, and one of Cullinan’s Easter eggs is a clever design that wraps the door beneath the sill. This setup intends to keep your legs away from the muck when climbing out of your tidy oasis and into the big, messy world.